I’m easily distracted by critters — no matter how common they may be. It could be an Eastern Harvest Mouse that grabs my attention for a half-hour. On a recent stroll around our wetlands, I was entranced by the coloring of our very common American Coot, as a mating pair stood in the shallow waters at dusk. Their dark grey / black feathers, white bill, and red eyes against the darkening waters of the approaching night sky was lovely. It wasn’t a Great egret in full breeding plumage, no…. But just as striking. There weren’t many other human visitors, but I managed to attract a doozy. Off-season, I’m alone in the wetlands; during the season, I’m accompanied by a bevy of snowbirds. A female leaned over to see what I was engaged with — it had to be an exceptional find, after all — and *snorted* before replying to her equally charming companion: UGH! UG-AH-LY! And BORING. WHAT’S THE POINT?!? I was ready to say the same about her outfit, but she stomped off to insult some other hapless bird in the nature preserve before I could reply. American Coots may be common in certain areas — in Florida, for instance, they’re year-round residents — but ugly? Boring? Unnecessary? Honestly. Do I go to your home state and randomly insult the poor animals? No. And not to be trite, but ALL creatures deserve our respect. Just because they’re common doesn’t mean that they’re 1) not beautiful and 2) not imperative to the ecosystem. Coots have a profound ecological impact in the wetlands: One estimate from Back Bay, VA, suggests that the local coot population ate 216 tons (in dry weight) of vegetation per winter. 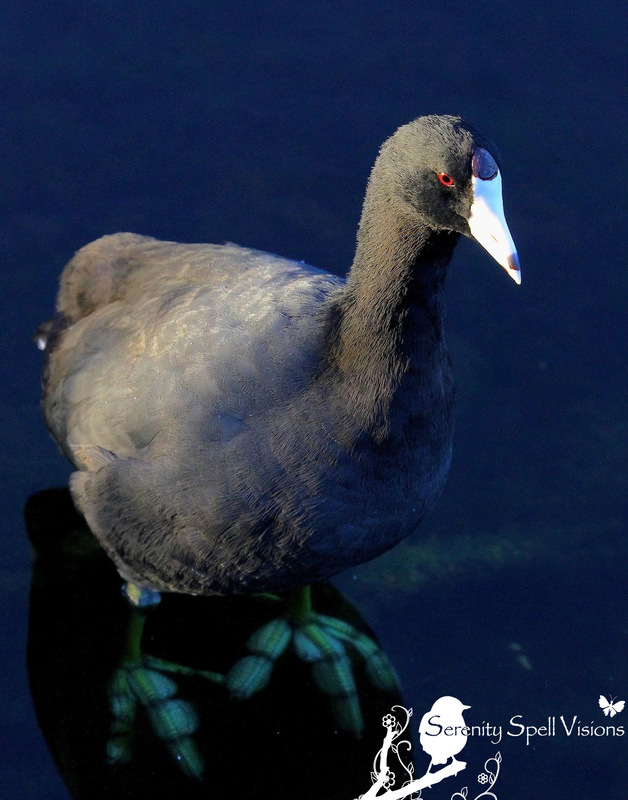 They’re long-living: The oldest known American Coot lived to be at least 22 years, 4 months old! Looks like a duck, swims like a duck, but…. : Coots don’t have webbed feet. Each one of the coot’s toes has broad lobes of skin that help it kick through the water; these broad lobes fold back each time the bird lifts its foot, so it doesn’t impede walking on dry land, though it helps to support the bird in the mucky wetlands. Coots help science! Because coots are so common and widespread, scientists will monitor them as a way of tracking problems in the environment at large. I’ve seen a kajillion coots, but never their feet. What gorgeous feet! I should have added something about that… It’s actually cool. They swim like ducks, but don’t have webbed feet. Each one of the coot’s toes has broad lobes of skin that help it kick through the water; these broad lobes fold back each time the bird lifts its foot, so it doesn’t impede walking on dry land, though it helps to support the bird in the mucky wetlands. I’m always amazed and delighted at the specificity of traits for particular habitats. !! AND, beside having awesome looking chicks, how about those feet! Hee, aren’t their chicks adorable??? SO hard to photograph, though! Little bundles of black fur! Aw, thanks so very MUCH!!!! 🙂 XO!! …. Speaking as an “Old Coot” myself, I believe I have a horse in this race. Thank you for pointing out that in nature, there is joy in the prosaic as well as the sublime. Hahahh! Old coot, why am I only now just putting this together….? I am well acquainted with coots. Funny birds because they have no graceful moments either in the water or on land. No matter. The locals feed them cheap dog kibble in the winter as well as the wild ducks. Off season at the Lake is always welcome after a summer of boom boxes and left garbage. Unfortunately many of the visitors from ‘flatland’ miss the beauty of our hideaway. I fear you and your area suffers the same problems that we do, here. There are many respectful (seasonal) visitors, but the amount of TRASH and debris in these protected areas, during this time, increases GREATLY. It’s terribly sad. I don’t understand…. If you visit a preserve, a protected area, why you would throw your trash into this endangered environment? Sigh. I was taught at an early age not to litter. That sticks with you and to this day I could never throw trash on the ground ….any place. Early education. VERY true…. I was, as well. Taught a complete and utter respect for the environment and its creatures. I see otherwise in all ages, these days, which is curious. LOL! Very funny!! I visited the preserve Sunday and had nothing but the nicest people around. One poor guy came outfitted with a mega lens on a tripod and waited and waited for one of the Great Blue Herons to feed its chicks this mega fish it had swallowed. Stood around (bird that is) with a tremendously distended neck for awhile but all the way to sunset never did finish digesting it properly for the young uns. Personally I love coots and moorhens and think they do have the most amazing feet!! In fact way back in college when I took Ecology and Systematics, the first bird I think I ever got pointed out to me was the American Coots. So while they may not be the most dramatic bird one can photograph, they actually do have nice colors with the lime green feet and ruby eyes!! The feather detail and the pretty eyes in your pics look great!! You are the one with the vision and knowing how great what is in the viewfinder will look. Sometimes others just can’t see the light, colors or beauty!! You can teach with your pictures!! Hee… I often find the same — people leaning over or asking on a hike what I’m looking at, then quickly leaving, because I haven’t fulfilled their beauty quotient with my focus. But this was just appalling. I was seriously ready to defend the poor bird at her…might I add…VERY LOUD insults. Why bother visiting these natural spaces if you’re looking to be mean to the living creatures? Sheesh! But you’re right. I just stared at her sad behind and kept on shooting; it’s my business alone. 🙂 Fascinating little guys, though. Heeee!! SO true. I’m just in awe of people spending thousands upon thousands of dollars on lenses…or simply visiting a preserve…to insult the innocent creatures therein! To me, it’s insulting the divine. I LOVE that idea! I actually have a beautiful portrait of a Muscovy duck in my queue…. WOW are they a nuisance. Aggressive as all get-out, since I feed strays. I’m listening to them now, in fact. 🙂 But fascinating creatures, nonetheless. Thanks so much for your insightful comments…. XO! Aw, WOW…. LOVE IT! I just learned something!! I had no idea, and I’ve had friends from the bayous. You need to write up a post on ’em — that’s such a great little lesson about your area! Ah, Stacy beat me to it! Beyond everything she said, the poule d’eau plays a part in a very famous Cajun version of the Twelve Days of Christmas – I love this animated version of the song done by Tee Jules. When I made the trip to Minnesota that included the Spam Museum, I stayed on one of the lakes in Fairmont. Coots are summer birds there, and then they migrate down here. They’re the first birds of winter to show up around Galveston bay. Here’s a photo of a group in Minnesota getting ready to migrate. I love the things! SO incredibly fascinating!!! I had no idea…. SO not boring. And, I’ve never seen such a group like this — of course, they’re never getting ready to migrate down here, since they’re year-round residents. They’re usually by themselves or with one or two others. It’s so sad that most people only value the uncommon species,they don’t know what they are missing. So incredibly true…. And look how helpful and fascinating these guys are! So integral to the wetlands, and they can live DECADES! Just amazing. But yep, if you go out and insult ’em, you’ll really shut your eyes and heart to all the lovely things out there. The greatest part of wildlife viewing is the seemingly endless variety, If every bird was a peacock how boring would THAT be?! SO very true!!! Such a GREAT point…. I love, adore seeing the beautiful larger guys — but just like with people, I LOVE LOVE LOVE all the differences! Ah, it was difficult. But when it comes to animals, my normally very shy self becomes louder. 🙂 I chose to duck my head in her (very loud) anger, though. Whatta character. What an idiot that person was to make such a remark. It is distressing to be faced with how blind many people are to the wonders of nature. We have a raft of coots right now in Lake Washington near Seward Park, and they are fascinating to watch. The way they move while in a group is positively hypnotic! And, they make such an interesting pattern, with their dark bodies blending into the dark water (reflecting our gray skies, of course! ), and just their light bills standing out. But, my favorite thing about coots is their feet. They look more like leaves on an aquatic plant than feet. It’s rare to see a good photo of their feet, but yours is outstanding! Thanks for sharing! I get to hear it all, in the SEASON here…. Off-season is another story altogether. People with lenses that cost more than a house, with no clue what they’re shooting — “I really don’t care what any of these birds are.” Errr….. And then those that randomly insult, that’s a joy. And the increased trash is sad to see when the snowbirds visit our supposedly protected and endangered wetlands and Everglades. But there are those, of course, who are just as enthralled by the area’s beauty, and respect it even though it’s not their *home* (but of course any part of this planet is their home, right?). THOSE are the ones I usually find, thank goodness!! I love the way feygirl captures the radiant beauty of each individual creature in her photos. If you have not seen Serenity Spell blog before, it is an experience not to be missed. NO!!!! This looks FABULOUS, especially since in my wealth of free time (hahahah!) I’m trying to write a children’s book. Thank you SO much for sharing this treasure… I’m going to look for it immediately! ooooh I will! I can’t believe I’ve never seen these!!! The coot was one of the first birds I learned to identify… must have been all of five years old. So I have always had a soft spot for them. We had a pond near our house that attracted mallards, coots and red winged blackbirds. There was even an occasional Great Blue Heron. My older brother would build rafts so we could check out the wildlife and play pirates. (grin) BTW, FeyGirl, your blog has returned to the list of blogs I follow. So it looks like WP solved the problem. Glad to have you back! Aw, I love it!! How wonderful…. Playing pirate with all that wonderful wildlife. What a great experience. I was working with WP yesterday to resolve the issue — apparently I had some corrupted code somewhere, eeks! They kindly helped me out. THANKS so much for alerting me to the issue, though!! You are welcome. I was missing my journeys into the Florida wilds! 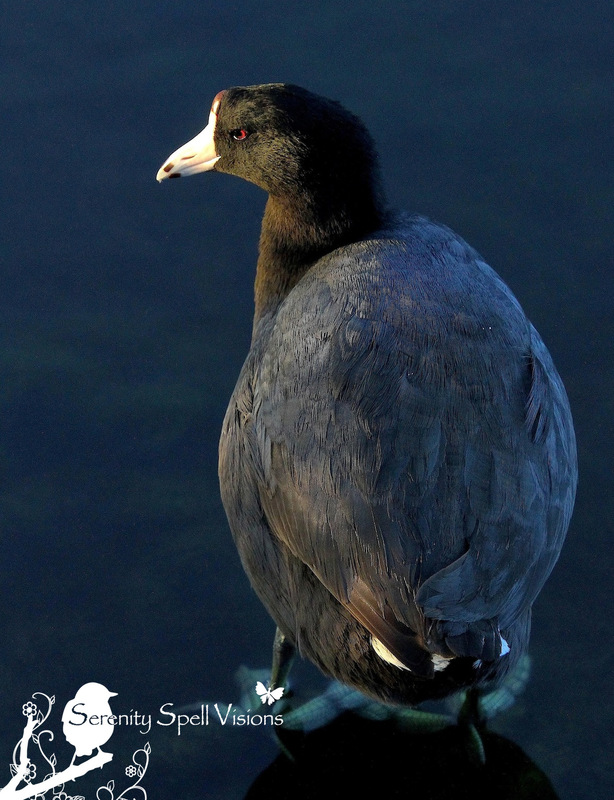 I think coots are cool, and these are awesome photos. ! Ditto as above, this showed up in my feed. Glad you got it worked out. Coots ARE cool! Common but cool, heee!!! I’m loving all the love for coots. Wow – what amazing shots of these lovely creatures. And look at their feet – they are almost pre-historic! Thanks so much! Aren’t their feet fascinating? That’s their defining part, actually (from ducks)…. That’s exactly right! I’ve really been trying to find the beauty in the common and the results are surprising. As for Coot, I’ve always liked it even those it’s common in summer. You did a great job on the photos of that difficult to photograph bird. Thanks so very much! Their babies are even a bigger hoot to photograph — little fluffs of black fur! People don’t realize how integral the common species are to the wetland (or any other) ecosystem…. And just how lovely they are, when looking at them with a loving eye. Always so interesting along with your spectacular photographs. Why visit a NATURE PRESERVE and insult the beautiful, innocent animals? Honestly, if you don’t laugh, you’ll just get angry at these even-angrier people! You (as a fellow nature person) would simply not believe the things that come out of these peoples’ mouths…. Again, mainly in the Season, where there’s more of a wider population, I guess. I just…don’t…understand! Go watch TV and yell at it, instead of the creatures! Ugly or boring: NO, never. So nice, so interesting. I agree…. REALLY fascinating little birds, for being so very common (in our area, at least). They live to be 20+ years! Wow! Who complained it was very, very dawmp. Said: “Ugly as my boot”! A ‘gator said: “No!”, then went “CHAWMP”! Ha! Love the coots! They are so goofy you have to love them. Also outstanding photos. They are super tough to get a good picture where the whole face is not just black. Very nicely done! Thanks so much — I just fell in love with their coloring against the darkness of the water due to the setting sun. They really are striking little animals when you really look at them. Thanks so much, Eddie!! I’ve been a bit distracted with life to post more often, but I’m not giving up! 🙂 I too hope you’re enjoying your season — thanks again!